Ben Coffin is a former foster kid who has never felt like he belongs anywhere. He has few friends, and enjoys spending time at the library after school reading science fiction books. Despite this, he is relatively happy with his lot in life. He has a loving adopted mother named Tess, and after he finishes school for the year (and she retires from her job as a speech pathologist), is looking forward to moving to Florida so that Tess (who is in her sixties) can benefit health-wise from the better climate. But everything changes when Ben finds an abandoned dog named Flip. The scruffy little canine is instantly devoted to him, and leads him to befriend the librarian’s daughter Halley, a fellow booklover. Together, the two of them aim to get Flip registered to become a therapy dog for children who have trouble reading- an activity that strengthens their growing friendship. Halley (who is battling an aggressive form of cancer) is also an aspiring novelist, and she allows Ben to help her create a magical narrative where the heroes have to thwart an evil villain and protect a magic box that holds ‘the greatest treasure’. The story progresses on a daily basis, and no one knows how it will pan out, its creators included. As these varying factors mesh together, Ben begins to reconsider his wish to move away from New York. This book is sweet, with tragic undertones and a profound realism. Unlike most teen novels, the author of this book doesn’t sugar-coat or romanticise any aspect of Halley’s illness- he tells it as it is. There is nausea and vomiting. There is frustration and angst. There is door slamming and multiple teenage tantrums. But there is also hope and positivity that she can beat the disease and reach 111%, which continues to be her goal. Halley’s cancer isn’t the only heartbreaking aspect to this novel, with Ben’s life taking a downward spiral after his living conditions change. But despite the sad factors of this novel, these are only secondary storylines to the main story. Flip the dog brings hope and positivity to all who he meets, and this main message is one that the author focuses on the most. The love that Flip shows towards people is honest and endearing, changing this book from a potentially depressing novel into one of sweetness. Likewise, Ben and Halley’s story creation is full of imagination and provides an outlet and escape from the misery in their real lives. Their characters’ experiences are parallel to Ben and Halley’s experiences, with a few magical variations thrown into the mix. 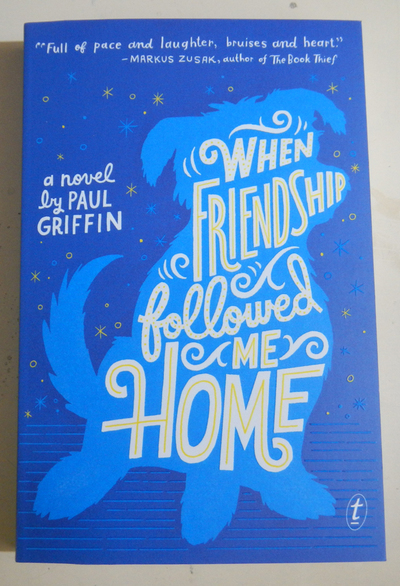 If you’re looking for a sweet and honest teen book about friendship and love, and aren’t afraid of the occasional sad moment, When Friendship Followed Me Home will be well worth your while.